Last week I pointed out that when your company is sold at price points around or below prices where you have financed your company then your proceeds in a sale transaction will not equal your fully diluted ownership percentage times the sale price. You will get less because some or all of the preferred shareholders will choose to take their liquidation preference instead of their percentage of the company. And in that post last week, I promised to show you all how to model this out. Before I do that, a couple acknowledgements. Andrew Parker and Christina Cacioppo had a hand in helping me put this liquidation model together (its the second tab in the google spreadsheet). Andrew built the original template when he was at USV and Christina modified it before sharing it with me. One of the jobs of an analyst or an associate at a venture capital firm is building these models. They are complicated and time consuming. I took a close look at Andrew and Christina’s work before creating this model. I built it from scratch (driven off the cap table model I shared a few weeks ago) and it took me a couple hours to do it. It’s not a simple thing to build one of these. I did it from scratch for a few reasons. First, I wanted it to be driven off the sample cap table and be part of that shared spreadsheet. Second, I wanted to do it slightly differently than Andrew and Christina’s model. And mostly, I wanted to prove to myself that I can still do this work. I passed that final test by the way. Ok, so with all of that out of the way, here’s how you model out a liquidation scenario. First lay out the capitalization of the company. List each class of stock, how many shares there are, what the cost of that class was, what the liquidation preference of that class is, and how much of the company each class owns. You can see that work at the top of the liquidation analysis in the section called “shareholdings”. As part of that work, you need to figure out what the terms of the various classes of preferred are. You need to know if they are straight preferred or participating preferred. And you need to know if there are any dividends paid in liquidation. And you need to know if any of the classes have a liquidation mutiple (1.5x, 2x, etc). If any of those things are present, put them into the shareholdings section as well. For the sake of this model, I assumed that all three classes of preferred (Srs A, Srs B, and Srs C) are straight preferred with no multiple or dividends. That makes all of this much simpler. I also assumed the Srs C is senior to the Series B which is senior to the Series A. If you don’t know what any of this stuff means, then I would suggest you head over to Brad Feld‘s awesome term sheet series and read the section on liquidation preference. Ok, back to the model (again, its the second tab). The next thing you do is lay out across multiple columns a range of exit values (sale prices). I chose $5mm to $55mm in $5mm increments. 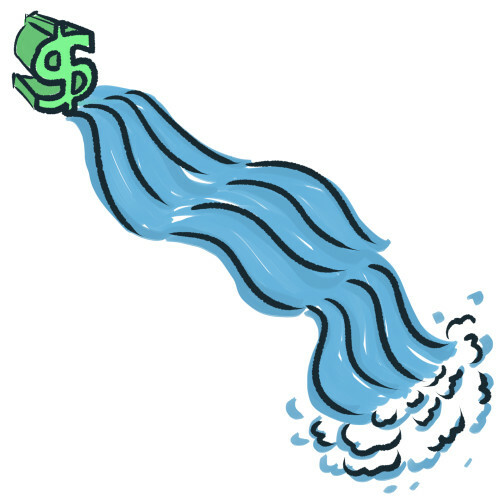 Then in the rows under those sale price headings, you lay out the liquidation waterfall. Start with the most senior class of stock (in this case Srs C), and figure out how much of the liquidation preference would be paid out in the specific sale price. Then figure out how much is left for the rest of the shareholder base after that class is liquidated. And then figure out how many fully diluted shares are outstanding after that class is liquidated and taken out of the cap table. And finally figure out what the value of that residual is per remaining share. That residual value per fully diluted share number is imporant. If that number is higher than the cost per share of the next class, the next class will convert to common in a sale and will not take its liquidation preference. If that number is lower than the cost per share of the next class, the next class in the waterfall will choose to take its liquidation preference as well. You do this work class by class until you get to the common and option holders. They do not have a liquidation preference so they simply share the remaining residual (if there is any) on the basis of how many shares they own divided by how many fully diluted shares are left in the cap table after the liquidation of various classes of preferred. Once you have worked through the waterfall by class, you then sum up the proceeds by class of stock. There are a couple reasons you want to do this. First, you want to show how much each class is getting in each sale price scenario. But this also serves as a great check on your work. If the total proceeds of all the classes equals the sale price, your formulas are working right (that doesn’t mean the model is right but it is one good check). Finally, you should add up the proceeds for each shareholder (or major shareholder). Each major shareholder will want to see how much they are getting in the various sale price scenarios. And this is again a great check on your work. A few final comments. First, I assumed that all of the options that are listed as “unissued” in the model cap table eventually get issued before the sale happens but that no additional options are added to the cap table. That is an unlikely scenario. Usually there are unissued options in the cap table at the time of sale and you need to take them out of the cap table before doing the liquidation analysis. And the choice of $55mm for the final sale price was not accidental. That is the next price increment above the point where all the preferred will choose to convert to common. That scenario has every class taking their fully diluted ownership percentage of the sale price. From that point on, there is no need for a liquidation model. That is why I ended there. Again, this is complex stuff. There are likely to be a ton of questions in the comments. And it is entirely possible that there are bugs in this model. If you find them, please point them out and I will fix them. But as complicated as this is, it can get even more complicated. Things like participating preferred shares and dividends and multiples make this even worse. A good reason to avoid all of that when you set up your cap table! Awesome info on stock classes! Of course, during an M&A it’s all paperwork and negotiation… There is also the case where the company sells at a price point where common is worth $0, but you have a great team that the acquiring company really wants. If you are in this sort of acqui-hire scenario, common shareholders and the acquiring company can use the team as leverage against those with preference. Common may technically be worth nothing but employees holding options, for example, may receive a hefty consideration for willingly canceling those options during the transaction. And the acquiring company may figure those employee considerations into their total purchase price and reduce the amount that is allocated to the preferred shareholders. This article was originally written by Fred Wilson on October 10, 2011 here.